Just a detailed list of FAILs on my part. Maybe some WINs too. 1. Left cell phone charger at home. Consequently borrowed one from a nice hotel staffer (even if she looks over every 2 minutes to make sure I haven't absconded with it). 2. Tried to record all of Charles Phillips presentation on camera. Battery died. Charger left in room. 3. Unable to get a decent wifi (I keep typing "wife" there for some reason, like wifeless...) connection anywhere. You'd think they would be abundant in a city like this (or I would have thought them abundant). No go. 4. Organizers are working diligently to add wireless access recently adding it to Level II. The official wireless SSID is COLLABORATE. Use others at your own peril. 6. 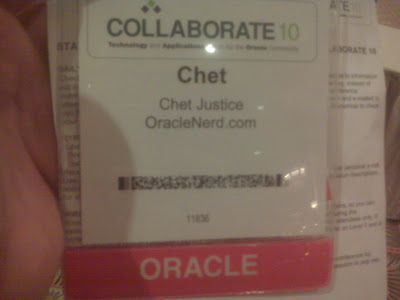 I am apparently an Oracle employee. At least that's what my badge says. 7. They still don't know what to do with me. I am on the press lists of course...but I think they're still trying to figure out how to handle me. 8. Did an interview with Billy Cripe and gave a shout out to my Ash friends...I'm pretty sure I looked and sounded stupid, but what can you do? 9. Oracle ACE Dinner was cool. I'm never one to turn down free food...but I thought I had my limit of beers at the OAUG event last night. Ooops. 10. Woke up at 7:15. Love that I'm still on EST. 11. While looking for a phone charger at 7:20, saw people stumbling around from last night. Very amusing. Hopefully I'll get pictures tomorrow. I do remember what that was like, but those memories are fading. How about your Viagra? You forgot that one too?